The World Cup is upon us and Brazil has been busy constructing new stadiums to host the influx of fans, but not all of them are exactly sustainable. 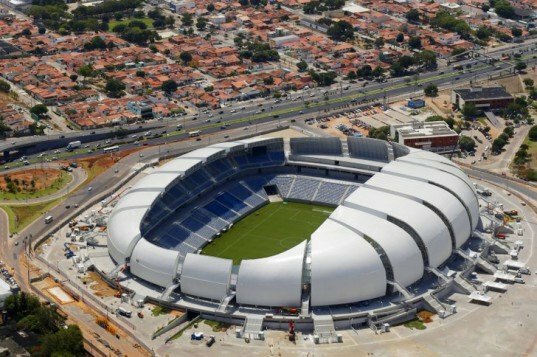 From delays in construction due to worker deaths to sucking up natural resources, the twelve stadiums have ended up costing both Brazil and the environment a lot more than was bargained for. After the games, many of these stadiums will be too large to use for regular games, potentially making them a waste of space in the future. Fast Company has created a hilarious round up ranking of the twelve stadiums, and we’ve followed suit with an evaluation of sustainability. 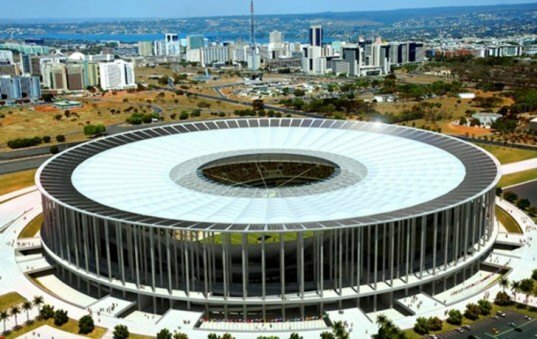 Brazil’s capital of Brasilia’s national stadium was remodeled by Casto Mello, who nearly dismantled the 42,000 seat stadium to accommodate over 70,000. The LEED Platinum stadium is flooded with natural light, features 2.5 million MW of solar energy, rainwater capture system, prefab parts, and will even plant 5,000 new trees. The Arena Corinthians in Sao Paulo was a total fail—it cost 14-18% higher than budget at around $413 million, caused the death of 8 workers during a construction collapse, and remains unfinished in time for the final test games. This historic stadium got a total green makeover with a sprawling rooftop solar array that radiates around the structure’s circular roof. The 1.4MW solar array will hone energy that will be distributed to the grid, powering homes in the area. The stadium will also be used for the 2016 Olympics. Fernandes Arquietos Associados updated the 1950s stadium with a floating roof that can double as a screen for video and lights, and can also provide much-needed shade in the blazing sun. The stadium will also be reused in the 2016 Olympics. 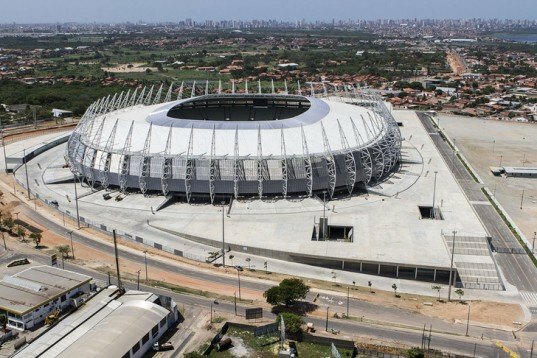 Schulitz Architekten and TETRA Arquitetos’ stadium, which replaced the Salvador da Bahia stadium, nabbed LEED Silver status this year. The stadium features a floating restaurant, one of the world’s lightest stadium roofs, and was built largely from materials recycled from the old stadium. Located in the city of Fortaleza, the 1960s stadium was expanded for the 2014 FIFA World Cup, including a larger roof to provide more cooling shade, an underground car park to free up the land surrounding it, and a lower tier for more seats. Castelao was the first redevelopment to be completed. Like Castelao, das Dunas was completed long before the last minute—and under budget. 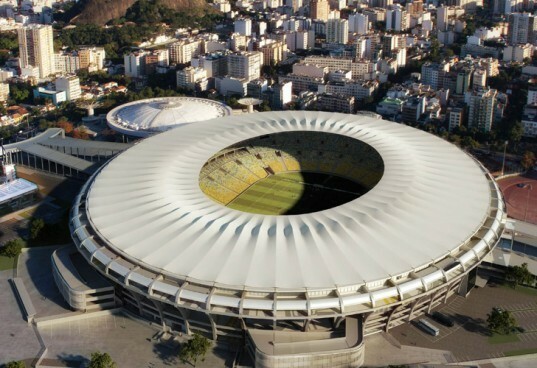 Located in Natal, the Populous- designed stadium was inspired by the shape of moving dunes, and is made up of petal-like roof pieces that respond to climatic conditions. Natural light, abundant cross-breezes, and a rainwater harvesting system make this one of the greenest stadiums at the World Cup. 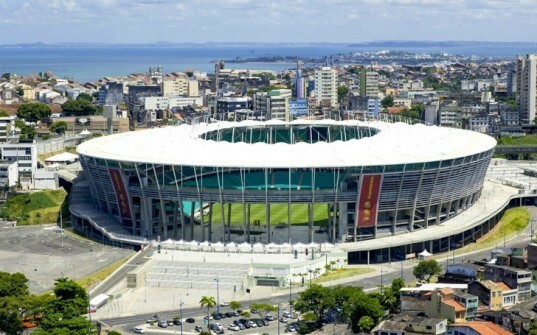 The 1919 square-shaped stadium was renovated in 1999, but given new updates for the FIFA games, including extra seating and a planned retractable roof that was later canceled. Built just for the 2014 FIFA World Cup games, the stadium was constructed with sustainability in mind. Local and certified-sourced wood, recycled construction waste, and air and soil control kept the project from becoming too big of a footprint on the local area. The adaptable structure will be reduced for mixed use after the games. The southern stadium is located in a chilly climate, so it doesn’t face the same issues of blazing temperatures like in other FIFA venues. Newly renovated for the games, the stadium also houses a chapel, events center, bars, retail stores and parking. Built by Odebrecht Infraestrutura specifically for the 2014 FIFA Games, the arena will serve as a new mixed use center that hopes to revive the area, including a university campus, hotel and convention center, residential and retail units. The stadium has also partnered with Neoenergia to creating a solar power plant that will output 1MW of energy, enough to fulfill the needs of 6,000 people when the stadium is not filled. Completed by gmp Architekten just in time for the World Cup, the new stadium is located in a near tropical region near the rainforest. Concerns about the heat, humidity and rain are already a concern for visiting teams. Sorry there are 16 million brazilians in extreme poverty. Never the less still a big, shame full number. Even if all the stadiums were in line with enviramentle times, still a rouge mistake and disrespect with all brazilians that pay one of the highest taxes in the world and get nothing in return. Not mentioning the 42 million brazilians tha leave on extreme poverty. Thank you for throwing lights on such a huge negligence for the sake of just entertainment. Estadio Nacional Brazil’s capital of Brasilia’s national stadium was remodeled by Casto Mello, nearly dismantling the 42,000 seat stadium to accommodate over 70,000. The LEED Platinum stadium is flooded with natural light, features 2.5 million MW of solar energy, rainwater capture system, prefab parts- and will even plant 5,000 new trees. Arena Corinthians The Arena Corinthians in Sao Paulo was a total fail- it cost 14-18% higher than budget at around $413 million, caused the death of 8 workers during a construction collapse, and remains unfinished in time for the final test games. 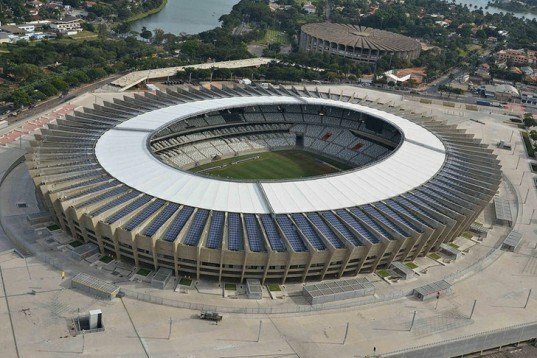 Estadio Mineirao This historic stadium got a total green makeover with a sprawling rooftop solar array that radiates around the structure’s circular roof. The 1.4MW solar array will hone energy that will be distributed to the grid, powering homes in the area. The stadium will also be used for the 2016 Olympics. 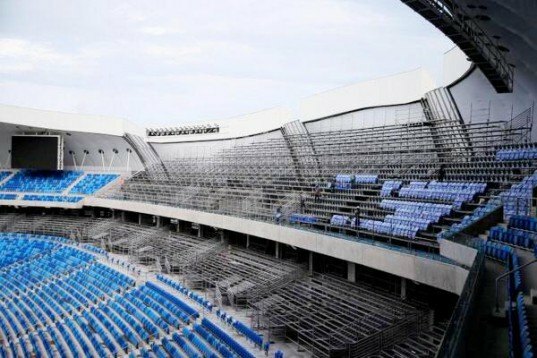 Estadio Do Maracana Fernandes Arquietos Associados updated the 1950s stadium with a floating roof that can double as a screen for video and lights, as well as provide much needed shade in the blazing sun. The stadium will also be reused in the 2016 Olympics. 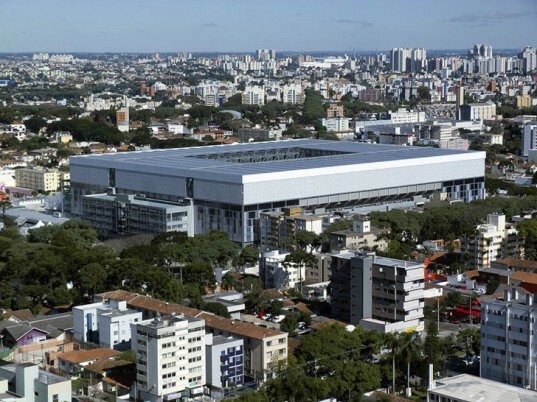 Arena Fonte Nova Schulitz Architekten and TETRA Arquitetos’ stadium, which replaced the Salvador da Bahia stadium, nabbed LEED Silver status this year. The stadium features a floating restaurant, one of the world’s lightest stadium roofs, and was built largely from materials recycled from the old stadium. Estadio Castelao Located in the city of Fortaleza, the 1960s stadium was expanded for the 2014 FIFA World Cup, including a larger roof to provide more cooling shade, an underground car park to free up the land surrounding it, and a lower tier for more seats. Castelao was the first redevelopment to be completed. Estadio Arena das Dunas Like Castelao, das Dunas was completed long before the last minute- and under budget. 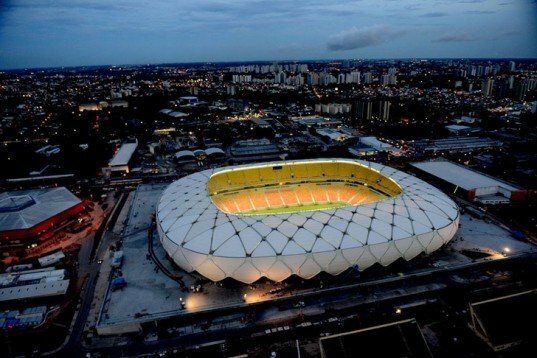 Located in Natal, the Populous- designed stadium was inspired by the shape of moving dunes, and is made up of petal-like roof pieces that respond to climatic conditions. 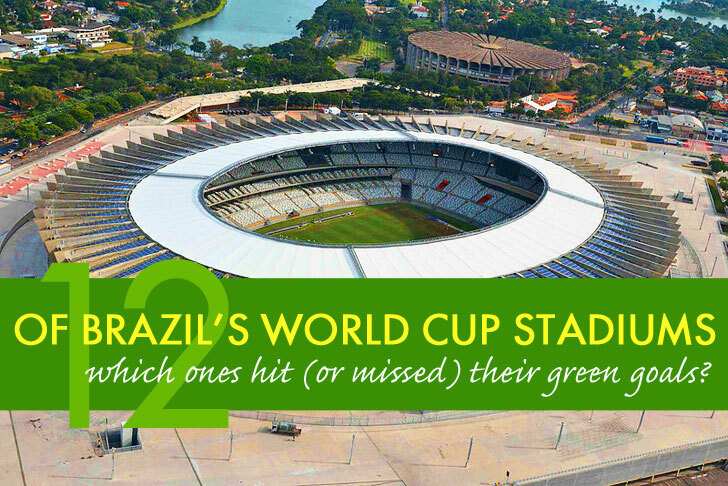 Natural light, abundant cross breezes and a rainwater harvesting system make this one of the greenest stadiums at the World Cup. Arena da Baixada The 1919 square shaped stadium was renovated in 1999, but given new updates for the FIFA games, including extra seating and a planned retractable roof that was later canceled. The 1919 square shaped stadium was renovated in 1999, but given new updates for the FIFA games, including extra seating and a planned retractable roof that was later canceled. 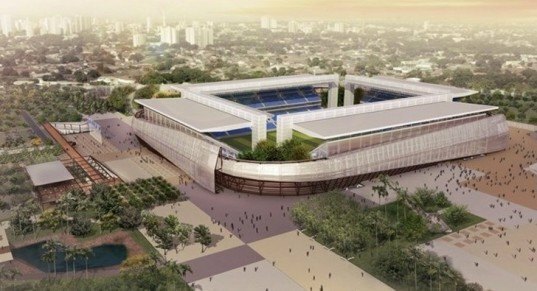 Arena Pantanal Built just for the 2014 FIFA World Cup games, the stadium was constructed with sustainability in mind. Local and certified-sourced wood, recycled construction waste, and air and soil control kept the project from becoming too big of a footprint on the local area. The adaptable structure will be reduced for mixed use after the games. 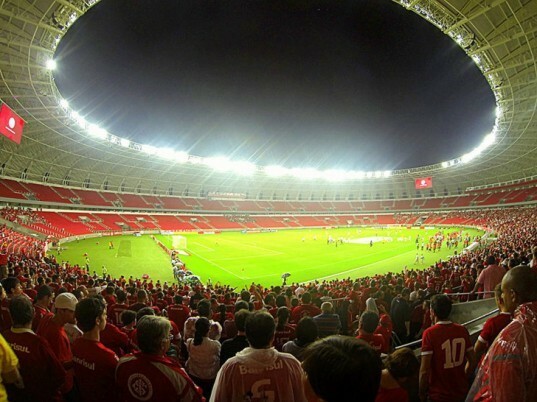 Estadio Beira-Rio The southern stadium is located in a chilly climate, so doesn’t face the same issues of blazing temperatures like in other FIFA venues. Newly renovated for the games, the stadium also houses a chapel, events center, bars, retail stores and parking. The southern stadium is located in a chilly climate, so doesn’t face the same issues of blazing temperatures like in other FIFA venues. Newly renovated for the games, the stadium also houses a chapel, events center, bars, retail stores and parking. Arena Pernambuco Built by Odebrecht Infraestrutura specifically for the 2014 FIFA Games, the arena will serve as a new mixed use center that hopes to revive the area, including a university campus, hotel and convention center, residential and retail units. The stadium has also partnered with Neoenergia to creating a solar power plant that will output 1MW of energy, enough to fulfill the needs of 6,000 people when the stadium is not filled. 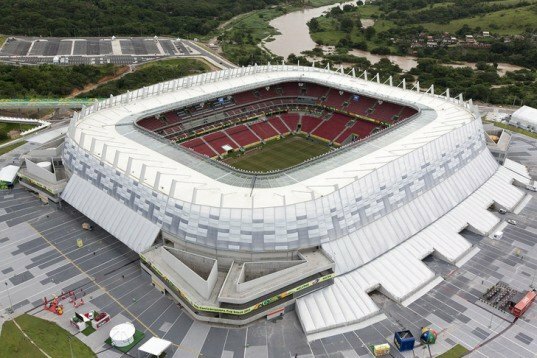 Arena da Amazonia Completed by gmp Architekten just in time for the World Cup, the new stadium is located in a near tropical region near the rainforest. Concerns about the heat, humidity and rain are already a concern for visiting teams.